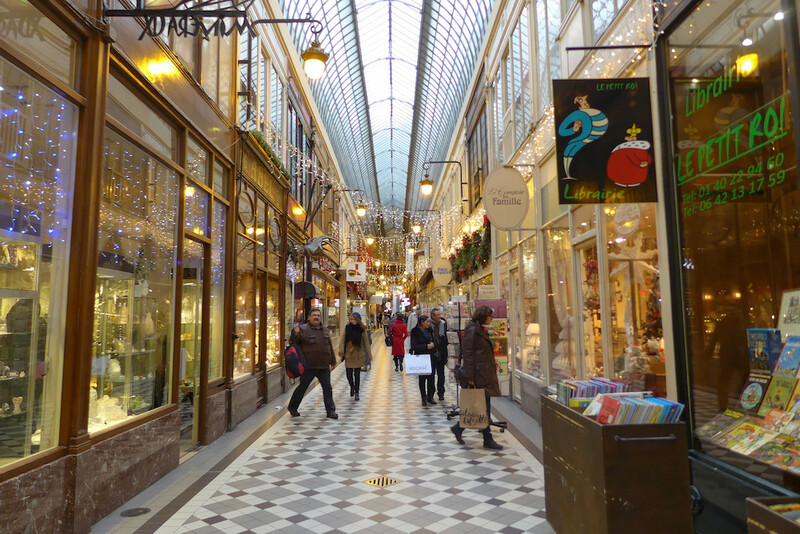 I like to have a walk in the Passages Couverts in Paris. 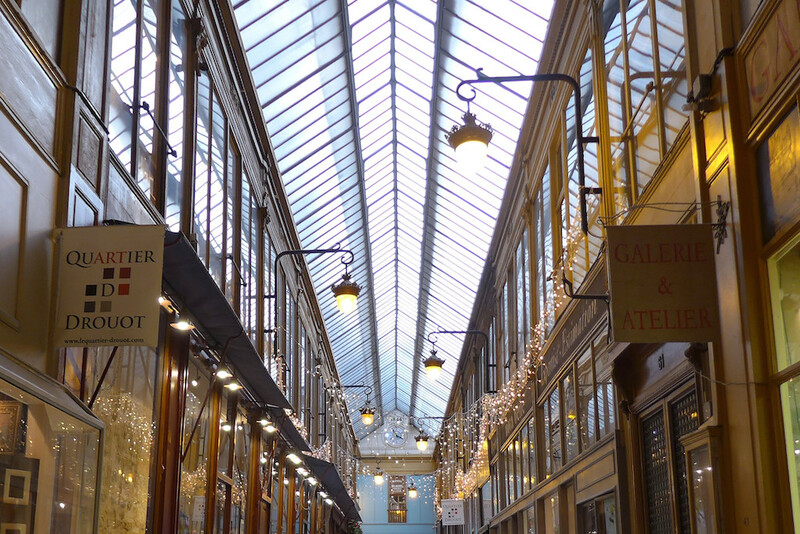 Those galleries date from the beginning of the 19th century and were in a way the precursors to our modern shopping malls. Most of them have beautiful glass roofs and are true architectural gems. My favourite walk starts from the metro station Le Peletier and ends four metro stations further south on metro line 7 at Palais Royal. It enables to discover four of the main Passages Couverts, all different and each having a very special character. 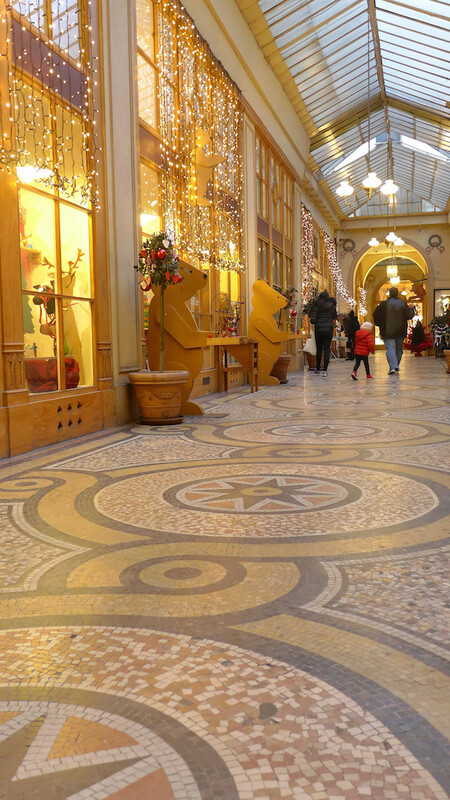 This walk is even more magic during Christmas time as the galleries are all decorated with tinsel and fairy lights. You can choose a rainy day as the galleries are covered; but keep your coat as they are not heated at all! 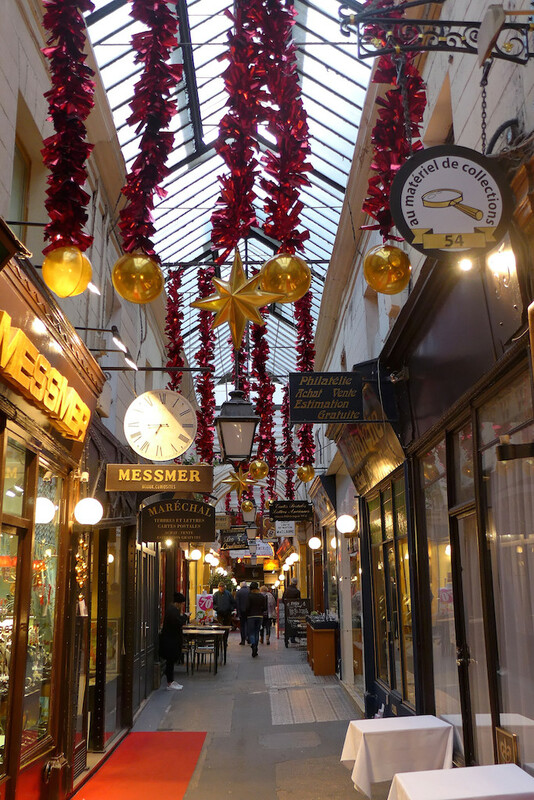 The entrance of the Passage Verdeau is located on the Rue du Faubourg Montmartre at level of 31bis. 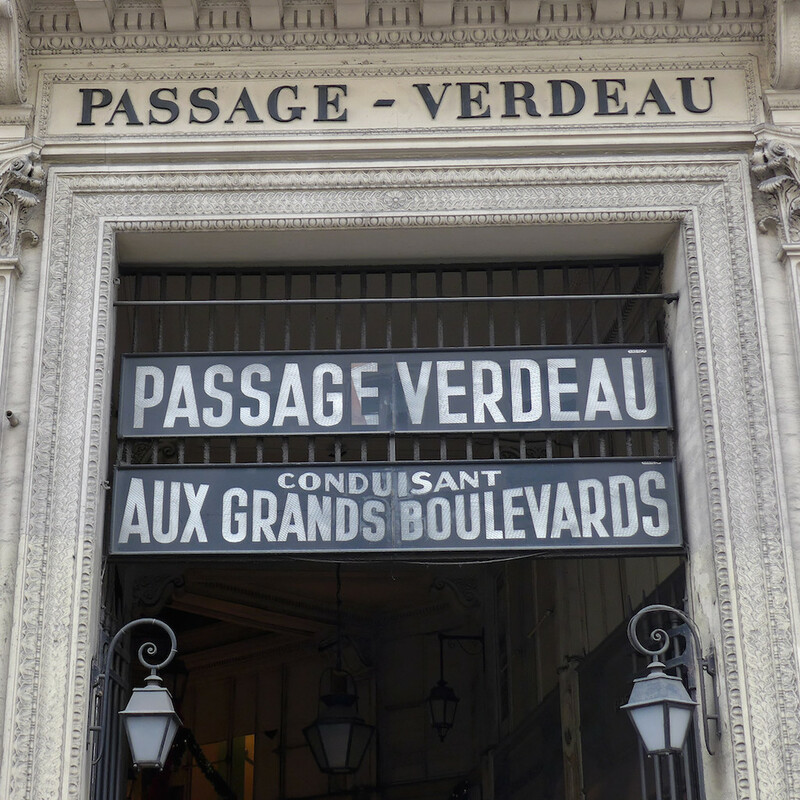 One cannot miss it as not only the name of the Passage is mentioned but also the following inscription: ‘ Conduisant aux Grands Boulevards’. 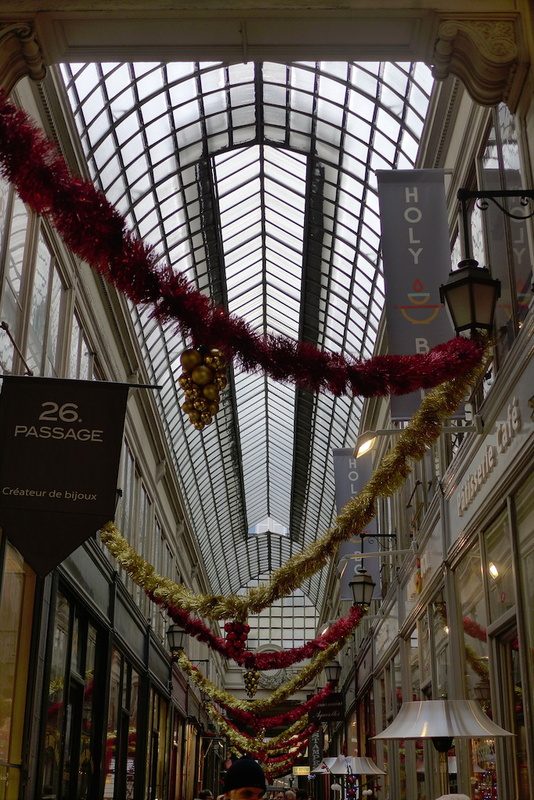 The Passage Verdeau was built in 1847 and took the name of one of the creators of those new shopping galleries. Immediately after entering one is surprised by the brightness of the place which is due to its high glass roof… which is designed to look like fish bones! 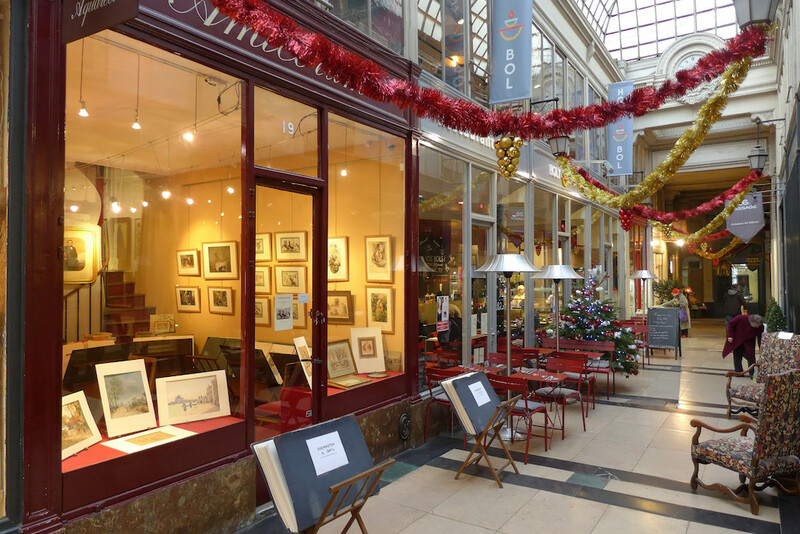 Among all the galleries the Passage Verdeau is the one specialized in old books, old postcards or drawings, but also old comics and collectors’ cameras. 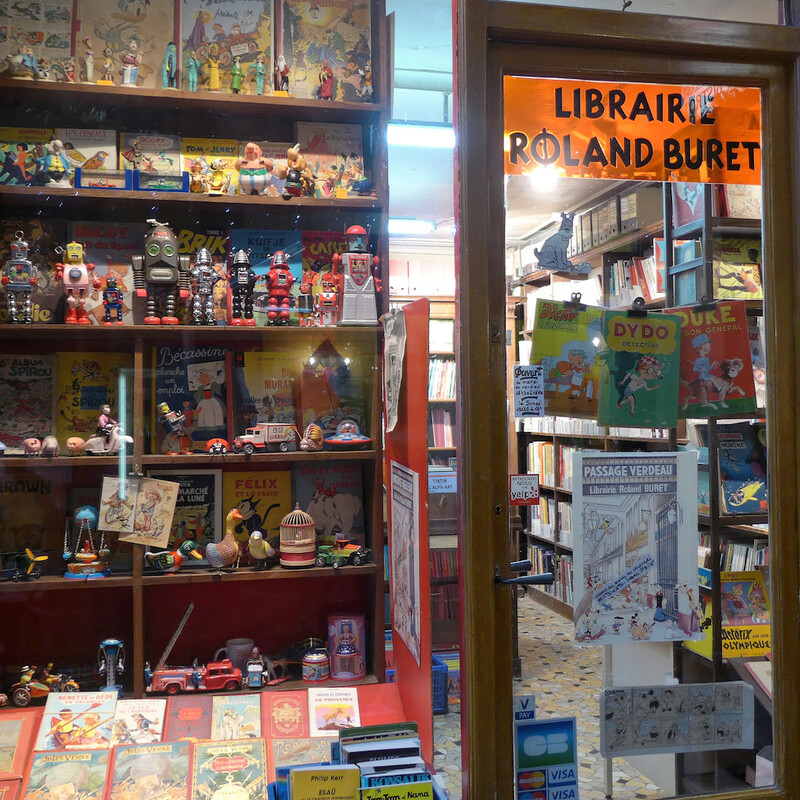 One of my favourite shops there is the bookshop ‘Roland Buret’ which is THE place where to find old comic books and newspapers: Le petit vingtième, Spirou, Le journal de Mickey,… If you are fond of comics and cross the doorstep of this bookshop you have better have plenty of time as it is a true Aladdin’s cave! 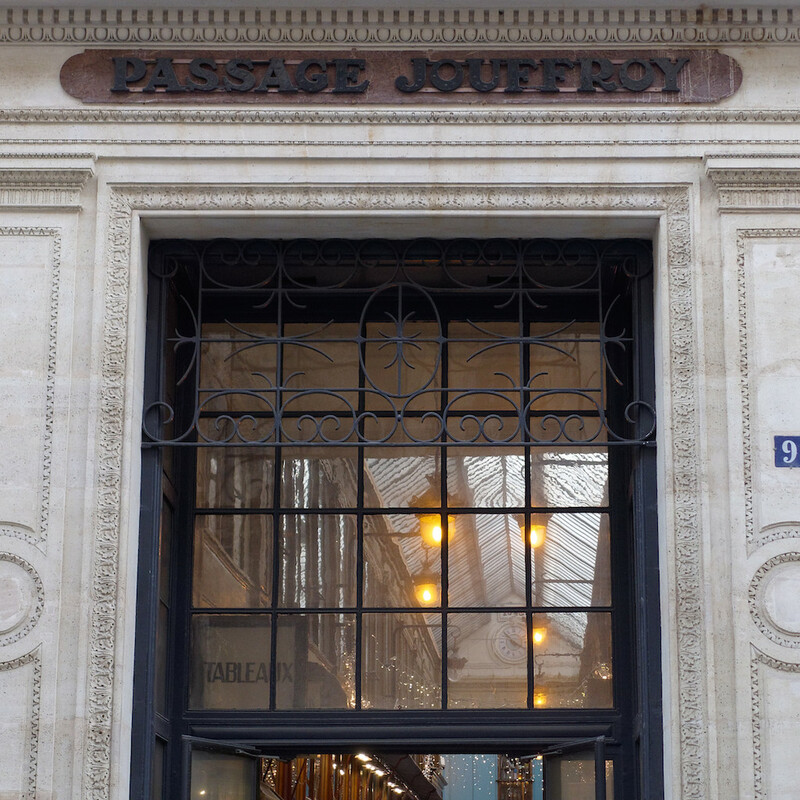 The Passage Jouffroy lies in the southern extension of the Passage Verdeau towards the Grands Boulevards. It is probably one of the most famous of all the Parisian covered galleries as it shelters the Musée Grévin, which is the wax museum of Paris. Its grey and white checkerboard floor and its glass roof make it a pleasant and bright place for walking. Moreover it is THE gallery for shopping and one can find there several wonderful stores. 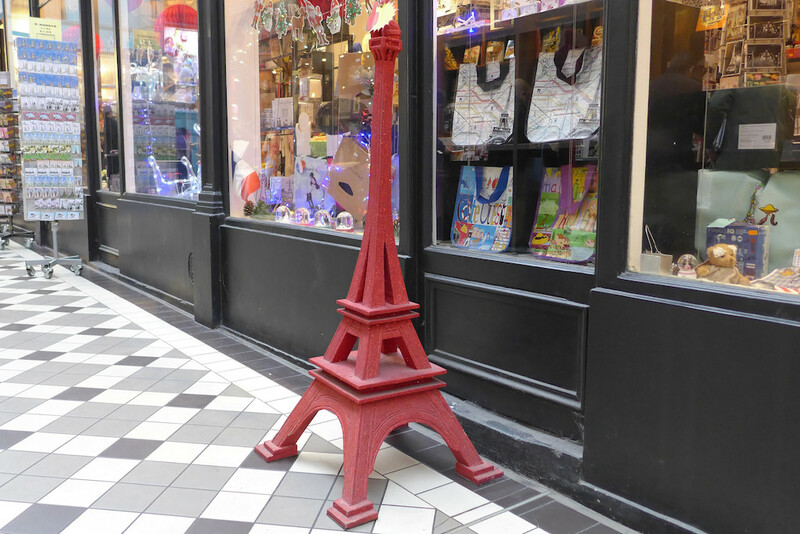 One of my favourites is ‘Pain d’Epices’, a beautiful children’s toys shop. Even if you do not enter it, you will be amazed by the doll’s house in the shop window and transported back to your childhood. 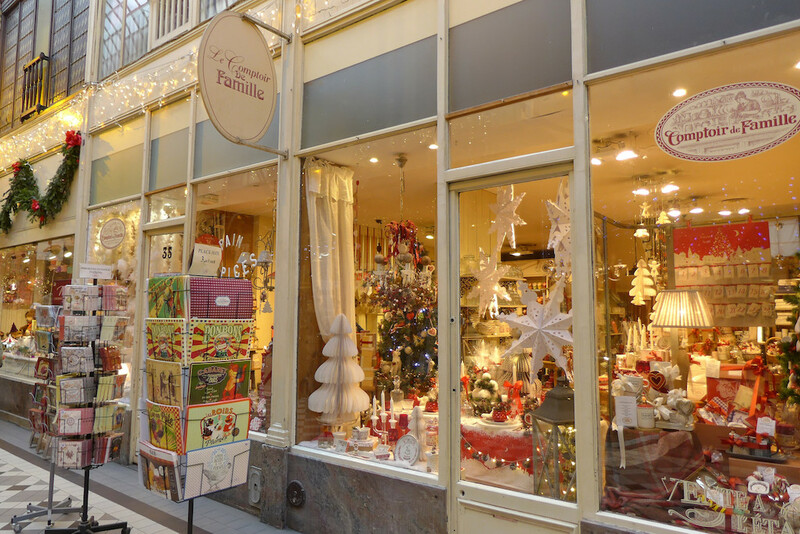 I also like: ‘La Boite à joujoux’, for its iconic figurines and small-scale models; and ‘Le comptoir de famille‘: This French brand for home furniture opened its first store in the Passage Jouffroy twenty years ago. They sell furniture, tableware, linen, and various decoration objects, all made ‘to bring the memories of yesteryear into the houses of today’. Their collections are in the same time functional and decorative and offer a good value for money: really worth the visit! And if you are more in search of old and eccentric shops, do not miss ‘M&G Segas’ on the opposite side and admire their antique canes: Gilbert Segas, the owner of the shop is THE expert in Paris for antique canes for more than fourty years! The way out of the Passage Jouffroy is on the Boulevard Montmartre. What a surprise to be back in the open air on a wide boulevard, back to 21st century, in the middle of cars and international store brands! 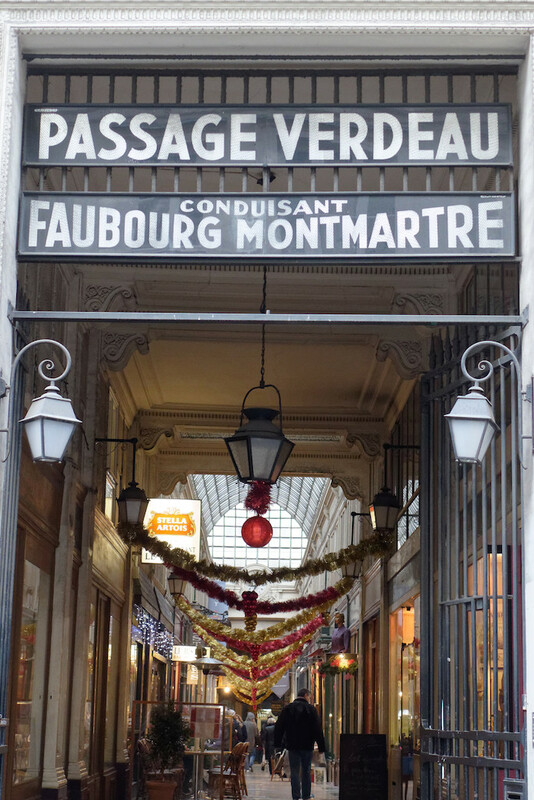 To be immersed again in the charm of the Passages and their outmoded atmosphere one only has to cross the Boulevard Montmartre: On the opposite side is the entrance of the Passage des Panoramas. 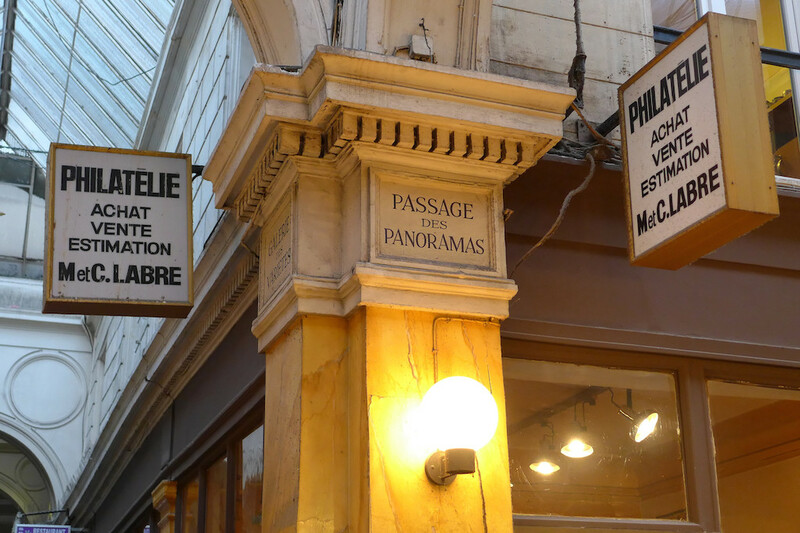 The Passage des Panoramas was the first Passage couvert built in Paris, in 1799. 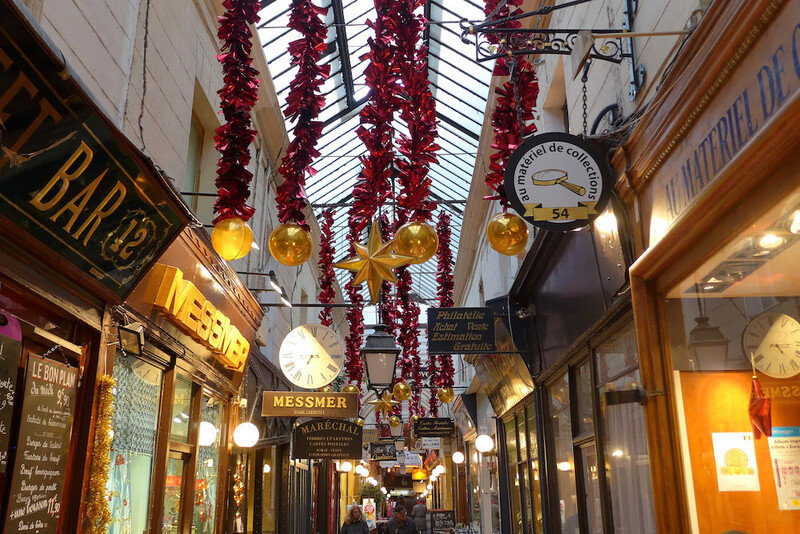 It is still the quirkiest and the most old-fashioned of all the Passages couverts in Paris. 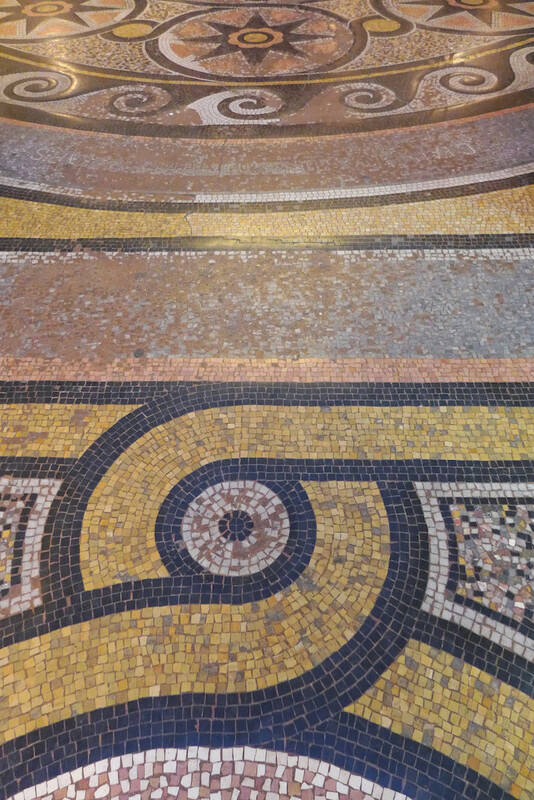 It is darker than all the others and its floor has not been renovated. And above all it is THE place for stamp collecting, which stengthens its timeless and dusty character. 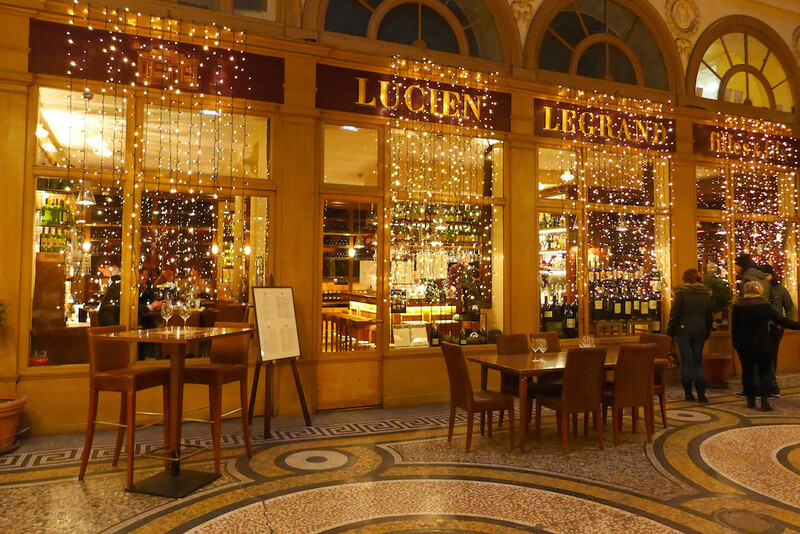 One can also find there a few wine shops and restaurants, among which ‘Noglu‘, well-know by Parisian people who are allergic to gluten. 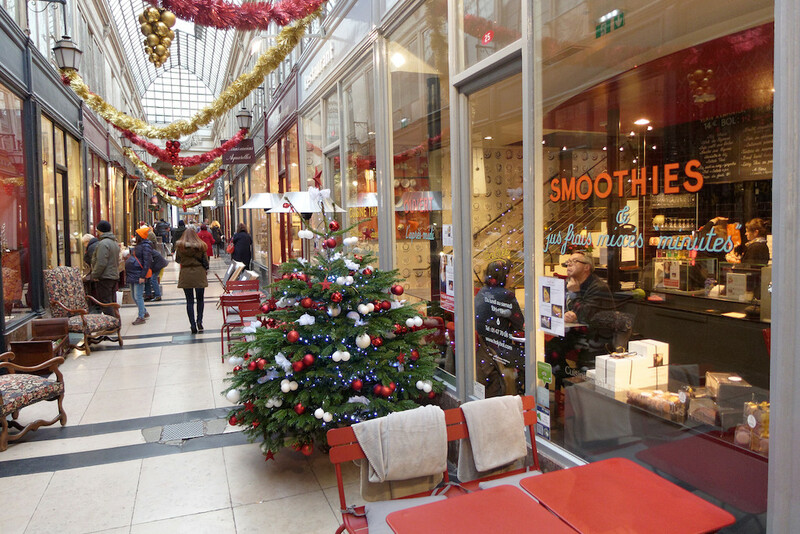 The way out of the Passage des Panoramas is on the Rue Saint Marc. 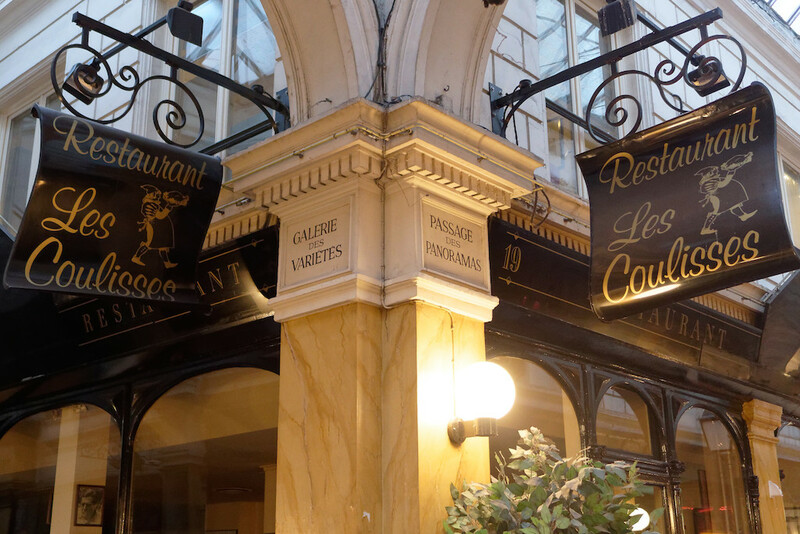 If you turn right and then immediately left you will be in the Rue Vivienne and this time a short walk in the open air is really welcome! One will pass in front of the ‘Bourse’ (the Paris Stock Exchange) and the ‘Agence France Presse’ and keep walking straight ahead in the rue Vivienne. 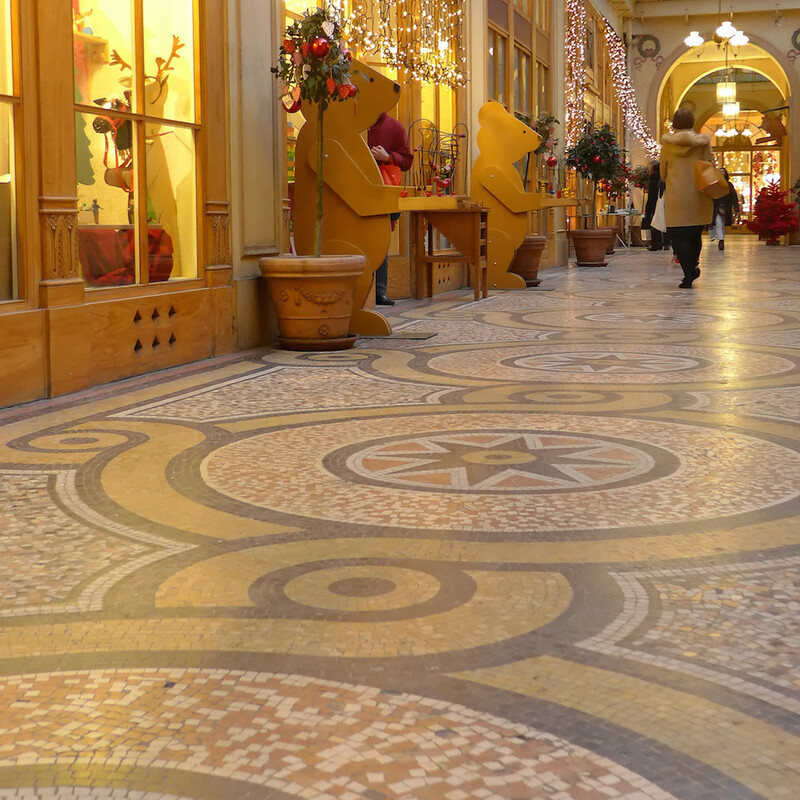 At the level of #6 on the left side stands the entrance of the most elegant gallery in Paris, the Galerie Vivienne. 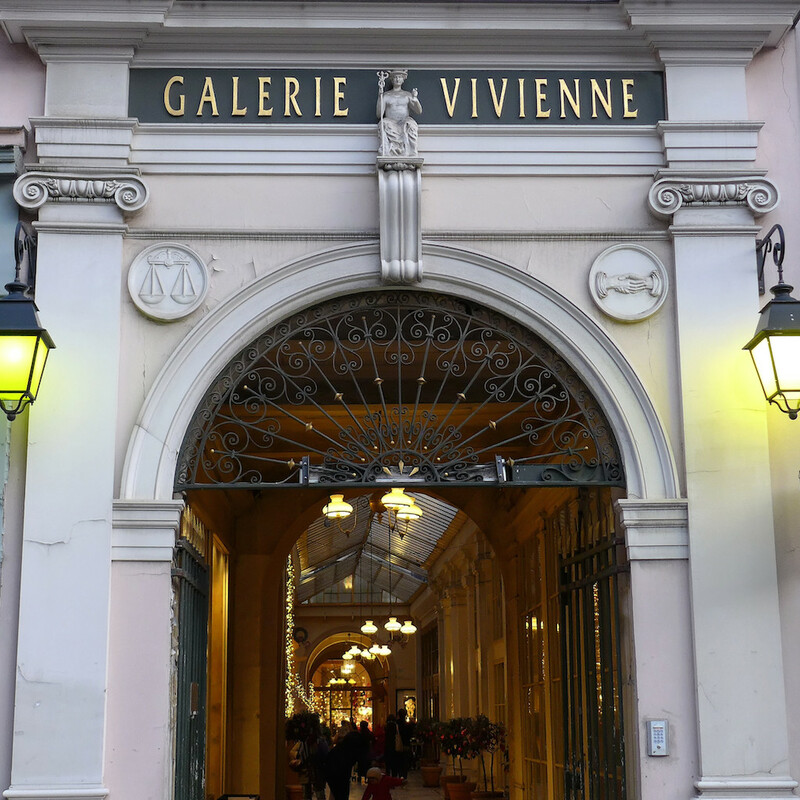 The Galerie Vivienne was inaugurated in 1826, fully renovated a few years ago and is in my opinion an architectural gem thanks to its beautiful mosaic floor and to its elegant glassroof. 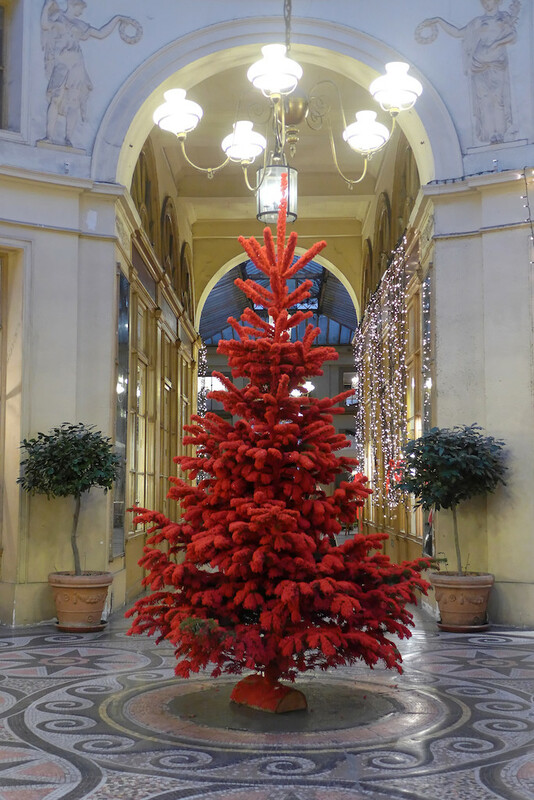 Moreover it has been beautifully decorated for Christmas : do not miss it! Shopping there is posible but could be rather expensive. 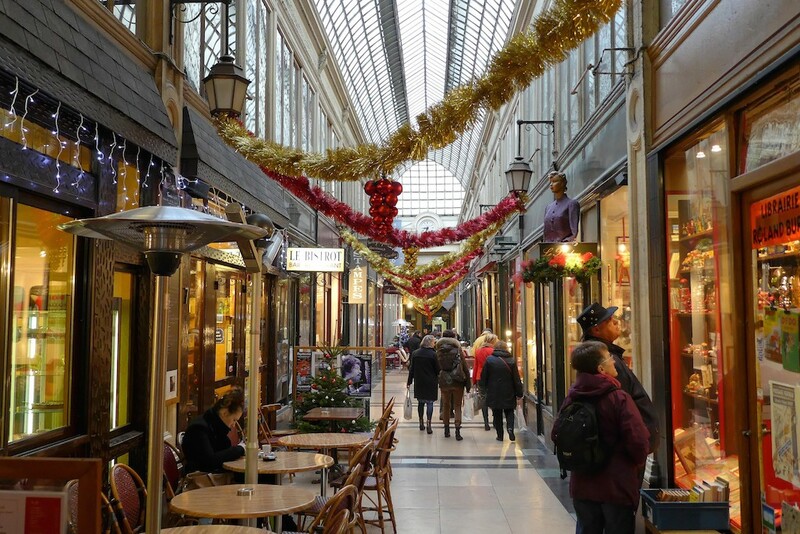 Indeed most of the shops are top of the range, including French and Japanese fashion designers (Nathalie Garçon, Catherine André, Yuki Torii,…), a wonderful florist (Emilio Robba), or several chic decoration stores. 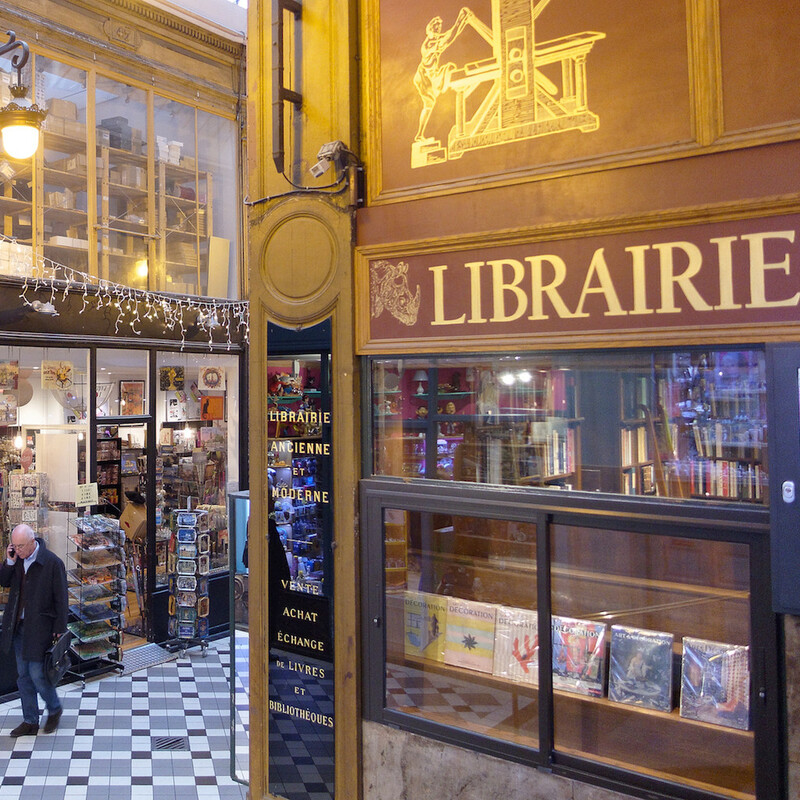 But one can also find there a pleasant children’s toys shop selling many wooden toys, ‘Si Tu Veux’, a famous bookshop, the ‘Librairie Jousseaume’ or one of my favourite wine shops in Paris, ‘Legrand Filles et Fils’. Located in the heart of 2nd arrondissement, close to the Jardins du Palais Royal, The Galerie Vivienne remains a place for a smart and elegant shopping while the Passage Jouffroy, which is further north near the Grands Boulevards, is more affordable. 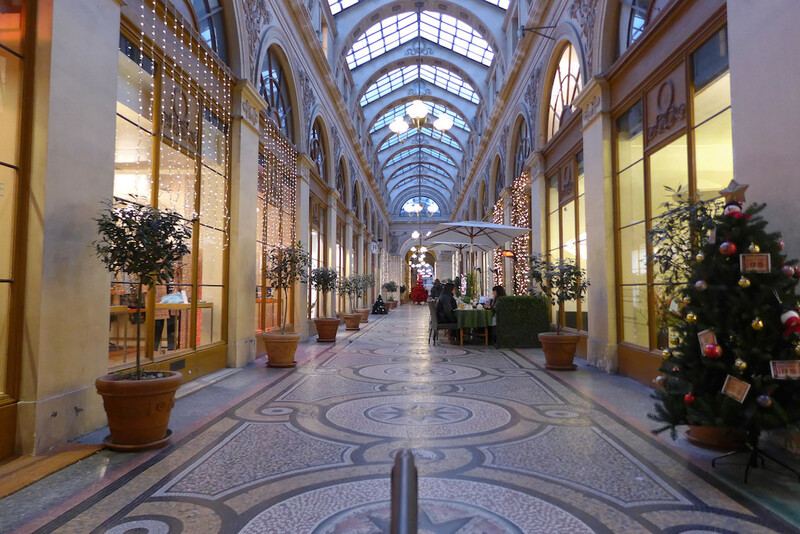 The way out of the Galerie Vivienne is on the rue des Petits Champs. Just cross it and you will find a last passage which leads to the magnificent Jardins du Palais Royal, a pleasant garden where to end this walk: Enjoy! 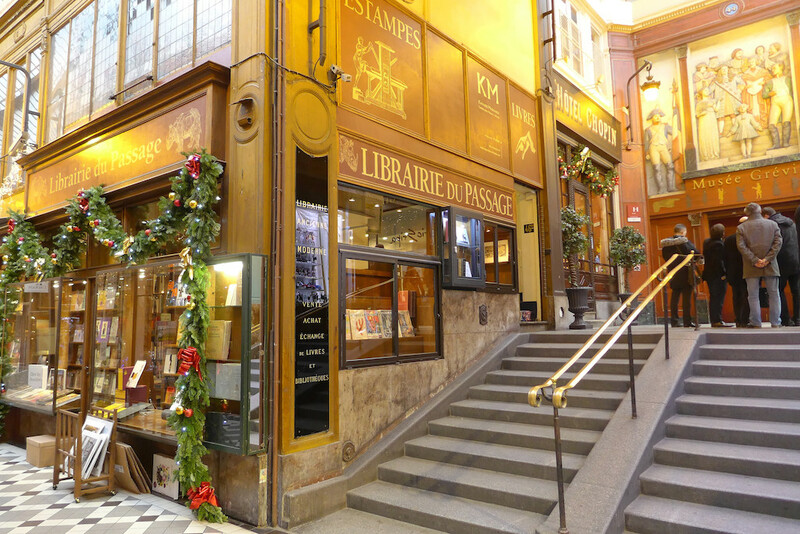 And before leaving you here are some pictures of the entrances of the Passages Couverts that we have visited. Previous Previous post: The New Musée Rodin in Paris: So Beautiful!